I love testing cleansers. If I could test them all day every day I would. (well I guess I would have to give my face a break one in a while, ugh) Here are 5 that I have put through the paces over the past few weeks and months. 1. Dr. Hauschka Cleansing Cream - I think of this more as a mask/cleanser than a standard cleanser. As you can see from below, it is a thick grainy texture so it is definitely better for a second cleanse or even a treatment. I add a bit of water to it to make a thick paste and then pat it on my skin. I use upward massaging motions to work it onto the skin for a minute or two and then gently rinse it off. My skin is left smooth, plump and hydrated. Truly a unique product. 2. Zelens Z Pure Cleansing Liquid Balm - Boy is this stuff thick! Which initially had me wondering whether it would perform better as a makeup remover/first cleanse or massaging second cleanse. I did feel that it removed makeup nicely, but it's a pricier cleanser so I would prefer to leave it as a second cleanse and really work it well into the skin. Because it is so thick, I like to remove it with a warm cloth and love the final result of how my skin feels and looks. Definitely another win from Zelens. 3. Sjal Deep Pore Cleanser - We all know how judgey I can be when it comes to skincare and makeup and I often make snap decisions about a product from just the name or appearance. I am forever proven wrong, but yet I keep doing it. Here was another example of a judgement gone wrong. I saw "deep pore cleanser" and immediately thought it would be foamy and stripping and designed for oily skin but leave my skin feeling worse. And this was after falling in love with the 2 Sjal masks....I'm a tough audience. Welp, my assessment couldn't be further from reality. This is the most luxurious and decadent creamy balm that glides over the skin like silk. I use this as a second cleanse because I want every bit of the key ingredients to get right on my skin and not be wasted trying to cut through makeup. Add water and this melts beautifully leaving the skin feeling like it's had a day at the spa. After a good 2 weeks of using regularly, my skin look noticeably brighter and my pores appeared cleaner and less noticeable. The cap is a bit troublesome to remove but frankly I could really care less because what's inside is so remarkable. Two thumbs up! 4. Soap & Glory Deep Cleansing Milk - First things first - this stuff smells unbelievable. It has a sweet and enticing aroma of fresh peaches and I wash just a few seconds longer each time to enjoy the smell. But yummy scent aside, the formula itself is soft, creamy and delivers just the right amount of moisture and hydration to balance my oily skin. I know this may seem like a bold statement from a product I was only recently introduced to, but it secured a spot in my top 3 favorite milk cleansers already. Yup, told you it was bold. But when you know, you know. Ya know? 5. Jurlique Nourishing Cleansing Oil - I typically don't write my blog posts in order of least favorite to most favorite, but in this case I ended with my favorite cleanser of the bunch. I have tried a lot (seriously, a TON) of cleansing oils and this was a stunner from first cleanse. The texture is thick but not too thick, and literally erases any and every trace of makeup from my face. Stubborn eye makeup, thick foundation, 13 layers of bronzers....not a match for this stuff. And while it is easy to emulsify and rinse off, it doesn't completely dissolve immediately. I have to work the water into the oil to really get a good milk which ensures I get a deep clean. My skin is left soft and smooth, and if I absolutely had to skip a second cleanse it wouldn't even matter. This stuff is that effective and my skin loves it. I told my mother to go out and buy this immediately. LOL. We love to chat skincare and text about our routines and I told her that her face needed this cleanser. Stat! I'm bossy when it comes to skincare. Sorry not sorry. Her face will thank me. 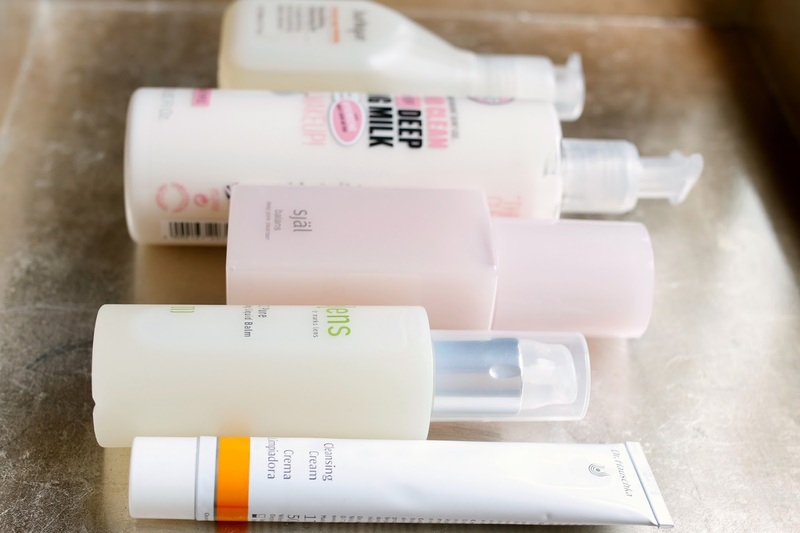 Cleansers are one of my favourite skincare items too! I will have to check out the Jurlique oil, sounds heavenly. My faves at the moment are the Tata Harper range, which I've just written a post about incidentally. I also really like the sound of the Sjal. It's a brand I've not used before but heard great things about. Soap & Glory all the way! Smells great, feels great and melts the make up away... what's there not to love? Great review btw.